This is the easiest Chicken Marsala recipe around. It takes all of the delicious flavors of the classic dish and bakes them over chicken for a one dish dinner that will wow. This Easy Chicken Marsala is not only simple, but also delicious and will have everyone cleaning their plates and asking for seconds. Sometimes you have an idea and you just aren’t sure how it is going to work out. You finally work up the nerve to give it a try and you are a bit nervous that you are going to have to order take out for dinner because it just isn’t going to work. Then you open the oven to take a peek and see how it is going, and you know it is all going to be okay. This Easy Chicken Marsala was a labor of love for me. My husband loves chicken marsala and orders it most of the time we go out for Italian. I have made it for him before many times, but I have never found a recipe that is simple enough to whip up on a busy weeknight. I really wanted to make this more accessible so I could make his favorite meal on more of a regular rotation. 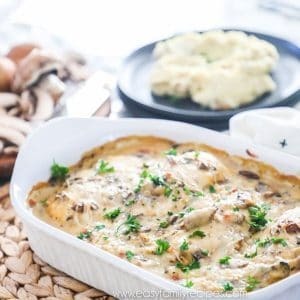 Although I wouldn’t call this an authentic chicken marsala recipe, it does take the classic flavor of chicken marsala and pack it all into a much easier to make dish. And it may not be authentic, but it sure is delicious! I thought long and hard about how to make this work, but the end result far exceeded my expectations. Let’s just say all 5 of my taste testers cleaned our plates tonight, and that is a rarity around here. I am so excited to share my one dish version of Easy Chicken Marsala with you guys today. One of the questions I get most on my recipes is how to serve them, or what to serve them with. Easy Chicken Marsala carries all of the traditional flavors of chicken marsala, so it can be served much the same way. On top of garlic mashed potatoes– This is our personal family favorite! On top of sauteed spinach– If you are looking for a low carb option this is my favorite! Garlic bread- Okay, so this isn’t green, but there is a lot of delicious sauce and a nice piece of garlic toast makes the perfect instrument to get it from the plate to your mouth. Other green veggies- Other green veggies like green beans, brussel sprouts, or broccoli make a great side for this too! I am going to walk through this recipe with you step by step below to make sure that you get the best results. I will share all of my preferences, notes, tips and tricks, but if you just want the quick version today, feel free to scroll on down to the bottom for the recipe card. 1.5 lbs boneless, skinless chicken breast (about 3-4 chicken breasts), trimmed- I prefer smaller chicken breasts. Smaller chicken breasts cook more quickly and evenly. If you can’t find small ones, you can either cut time in half or buy the ones in the market labeled thin cut. 3 cups baby bella mushrooms, sliced- I prefer baby bella mushrooms because of the delicious flavor which I think adds to the chicken marsala, but you can use regular white or most other standard mushrooms in this recipe. It might seem like a lot of mushrooms while we are making it, but once it cooks they cook way down so it will end up to be the perfect balance. 1 can (10.5 oz) Campbell’s cream of chicken soup- I use the classic cream of chicken soup from Campbell’s. You can also use low fat. Or if you are gluten free, you can easily make gluten free chicken marsala by simply substituting this gluten free cream of chicken soup recipe for the can. 1/3 cup Marsala Cooking Wine- If you have never bought this before, it will be found near the vinegars at the store. The alcohol will cook off while it is in the oven so there is no concern for who is consuming the dish. 1 cup freshly grated parmesan cheese- Use the kind that is grated not the kind that is powdery. curly parsley for garnish- Not necessary for flavor but it sure does make it look pretty! Lay the chicken breasts flat in a baking dish. Make sure your baking dish is big enough so that they aren’t packed in too tightly. They will cook more quickly if they have some room to breathe in there. 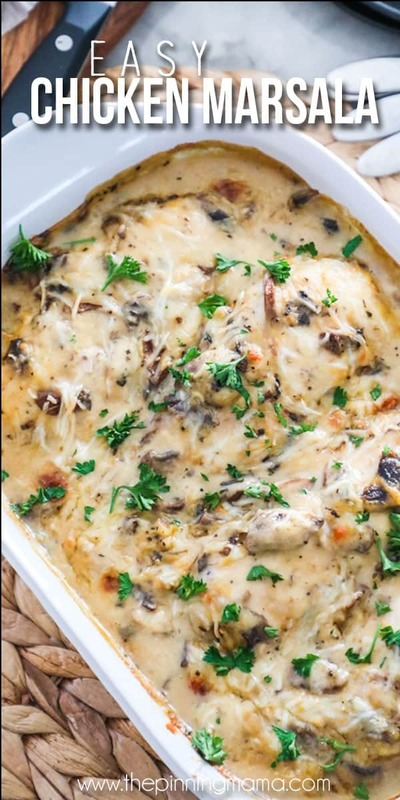 In a medium bowl, mix the mushrooms, soup, marsala wine, 1/2 cup parmesan cheese, garlic powder, salt, and pepper until combined then spread the mixture over the chicken breasts. Top with remaining 1/2 cup of parmesan. 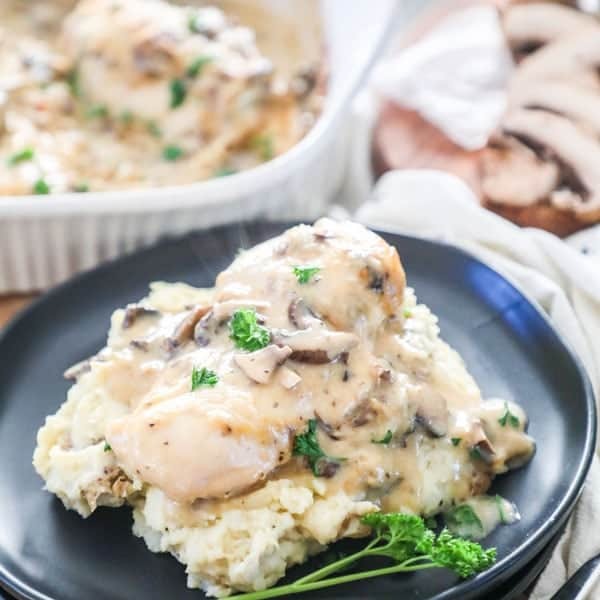 This is so simple and really allows us to grab as much chicken marsala flavor as we can while still keeping this recipe super easy. Bake on the middle rack for 25-35 minutes or until chicken is no longer pink (165˚F internal temp) then turn oven to broil for 2-4 minutes to brown the top and remove from oven. You should not need to cover this while baking. It has enough liquid in it that it shouldn’t get overly browned and being open will help give it the color we like, as well as cook of extra liquid. The cook time ranges from 25-35 minutes because it will vary based on how thick your chicken breasts are, how big and accurate your oven is, and the climate and altitude of the place you live. I would recommend setting the timer to 25 minutes, checking it, then continuing to bake if needed. Serve hot over potatoes, pasta, or rice and with a nice green side and a piece of garlic bread, and most of all enjoy! If you have a chicken marsala lover in your home like I do, I hope this hits the spot and gives you an easy chicken marsala recipe that you can add into your regular meal rotation. If you get a chance to make this dish, I would love it if you would take a moment to leave me a note. It just makes my day to know people are making my recipes. Or snap a photo and tag me on Instagram @easyfamilyrecipes so I can see what you are cooking! And before you go… don’t forget to sign up for my Hungry Email Club for more easy recipes! This quick and easy chicken marsala recipe gives you all the flavors of the classic dish in a simple one-dish dinner. Lay the chicken breasts flat in a baking dish. 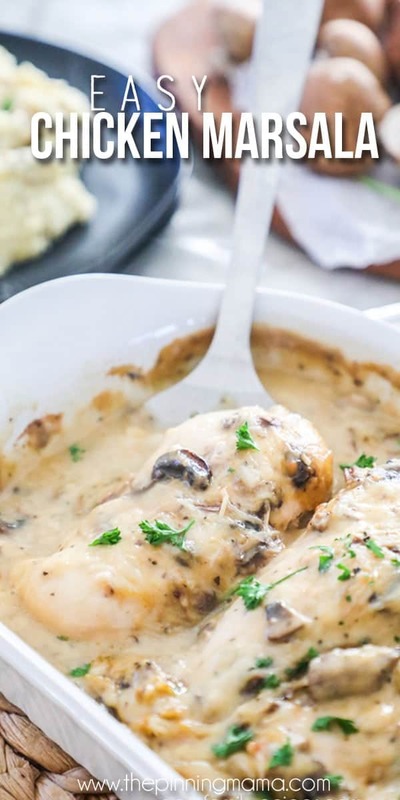 In a medium bowl, mix the mushrooms, soup, marsala wine, 1/2 cup parmesan cheese, garlic powder, salt, and pepper until combined then spread the mixture over the chicken breasts. Top with remaining 1/2 cup of parmesan. Bake on the middle rack for 25-35 minutes or until chicken is no longer pink (165˚F internal temp) then turn oven to broil for 2-4 minutes to brown the top and remove from oven. Serve hot over potatoes, pasta, or rice and enjoy! I love the way this look. I did not make this yet, but rest assure I will be, this week! I love your recipes. Yum! I made this last night! Very very easy. Due to the size of the chicken breasts (and I think this goes for most of the time now, maybe whatever chickens are fed, how they are raised, and just how big the breasts are, etc.) I typically keep them in longer- they just always need it. Id said to cook the chicken and make sure the cheese was super melty this dish was in for 40 min., maybe a few longer. Very easy though, had everything on hand and received good feedback from everyone. thank you! Made this for dinner tonight. Big hit with both my husband and me! And great on the freestyle points. Yum!